What is the Pet Nail Trimmer? Attractive design & easy-to-use features make this an ideal grooming tool for the at-home user. 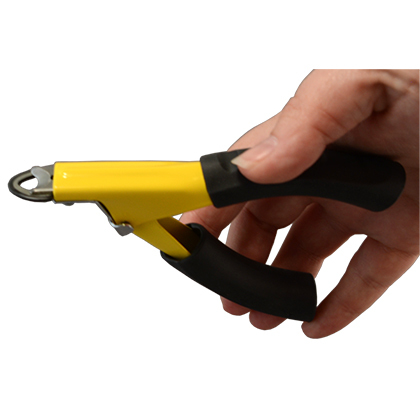 The sturdy metal construction and spring-loaded, rubber grip handle make trimming your pet's nails comfortable and safe for you and your pet. 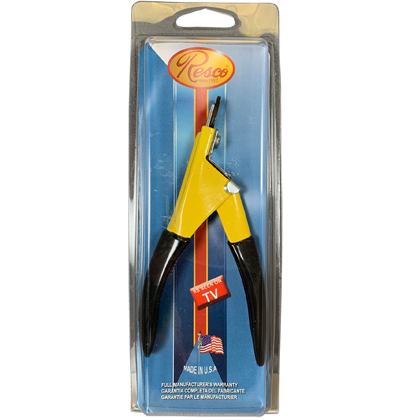 As a guillotine-style nail trimmer, the Resco Pet Nail Trimmer has a stationary ring through which the nail is placed, and a cutting blade that moves up to slice off the nail when the handles of the trimmer are squeezed. Always be careful not to cut too close to the 'quick', which contains nerves and blood vessels. It is painful and will bleed easily. On light-colored claws, the quick is the pink section and is easier to see. You cannot see the quick on dark-colored claws, making them difficult to trim without cutting into the quick. Cut dark colored claws in several small cuts to reduce the chance of cutting into the quick. Anyone can use the Pet Nail Trimmer because the heavy-duty construction requires less pressure and has a more positive cutting action. Use in bright light and cut each nail a little at a time to prevent cutting the quick. The quick is the fleshy section inside of the nail that contains nerves and blood vessels so that cutting causes bleeding. As nails grow, so does the quick. If your pet's nails are extremely long, trim just a little off and wait a week before trimming the nails again. The quick will regress a small amount each time the nail is shortened. Over several weeks, the nail can be shortened to the desired length without cutting the quick. If your pet's nails make a clicking sound when they walk, they are probably too long. Hold your pet's foot and press the toe gently so that the nail extends fully. If the nail curves beyond the bottom of the toe pad, it's too long. Replaceable Steel Blades, Rubber Handle Grips.